"Oooh, Professor Snape’s made an album" said my girlfriend, spotting this CD on top of another excitingly wobbly heap sent by our heroic editor. The Alan Rickman/Yuri Bashmet look-alike debate can continue elsewhere, but with darkly soulful portraits being the trend in several releases in the current catalogue I sometimes wonder where it will all end. There’s a new Haitink - Beethoven’s 3rd Symphony with the LSO - out there which just looks like the music has given someone a headache – not necessarily a guarantee of hit sales. This new CD from the distinguished and ever elegant-sounding Moscow Soloists is actually quite a tasteful affair, with a nice blue lining and picture disc. Bashmet and his players know the secret of good string chamber orchestral playing. Aside from the necessity for impeccable tuning, articulation and phrasing, the only real danger is an overall ‘beige’ result from a lack in dynamic contrast. Take any moment from Apollo, and you’ll find you ears constantly being teased from piapianissimo to mezzo-forte/forte, the genuine loud moments always roomy and unforced, but reaching up from a floor of genuine softness, so that the contrast and shape is ever present. Apollo is of course ‘Apollon musagète’ under a different name, revised subtly by the composer to make the work more of a concert piece, but altering it little from its ballet origins. Making a comparison with Esa-Pekka Salonen and the Stockholm Chamber Orchestra (Sony SK 46 667) Bashmet has a lighter touch and a more transparent sound, and with only seventeen players you might expect this. Both conductors appreciate the abstract nature of the works neo-classicism, but Bashmet is more playful, urging the faster variations forward and making the drama fleeting and elusive, giving the slower variations more rubato and infusing them with added value, not in terms of extra weight, but certainly in the way the music is narrated, drawing the listener along through rides both rugged and gentle. The vital Apothéose deserves a mention. No doubt it has something to do with Russian ‘soul’, but Bashmet wrings out more emotion than most in this movement, and the four minutes of its duration are filled with echoes explicit, elusive and ethereal. The Concerto in D came about as a commission from Paul Sacher, and Stravinsky’s idea was to create a work on the scale of one of Bach’s Brandenberg concertos. Once again, the Moscow Soloists fill the work with contrast. Rhythmic energy is a strong feature here, alongside beautiful lines and some string colours which make the hairs on the back of your neck stand up. Salonen is good too, but there is something in his approach which makes you realise he is a composer rather than a player. Bashmet is sometimes a little less explicit with harmonic or contrapuntal detail, but the impact of the playing creates a great deal more intensity and excitement. The opening of the second movement is a joy. Bashmet takes nothing for granted, but keeps us in an agony of anticipation as nothing and everything happens at the same time. This is one of those ‘you have to here this’ recordings, and you can have fun watching your friends gradually falling off the edge of their chair by the end, after the nothing which has happened, happens. The USP of this disc is of course the version for string orchestra of Prokofiev’s Visions Fugitives, which cover the youthful composer’s attachment to Scriabin, right up to the turbulent influence of the February revolution in 1917. I know the piano versions of these pieces fairly well, and found the sound world created by the string orchestra arrangements to be a little disorientating at first. Once you can accept these arrangements as pieces in their own right, rather than trying to find the recognisable ‘hooks’ which sound most like the familiar piano renditions, then things begin falling into place, and I soon gave up trying to put one up against another. I admire the way in which both Barshai and Roman Balashov, whose completion of the full set of twenty pieces is recorded here for the first time, avoid a slavish recreation of pianism. 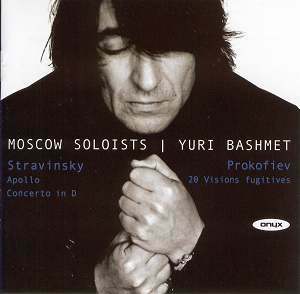 Rudolf Barshai made an arrangement of fifteen of the Visions Fugitives in 1962 for his own Moscow Chamber Orchestra, and Balashov, assistant Professor at the Moscow Conservatoire and himself a viola player with the Moscow Soloists, completed the set for this recording. Plenty of specialist string effects create a feeling of varied character in the movements, with pizzicato, col legno, harmonics and flautando moments making for fascinating listening, as well as the variations in perspective created by solo parts against accompaniment, and lines taken by entire sections. Everyone will have their own favourites, but I particularly liked the smoky mysticism in XII Assai moderato, the inevitable Shostakovich comparisons in nervy movements such as XIV Feroce, and the intense dissonant opening of XVI Dolente, against its salon second section and ultimate return in a lonely tremulando. The overall impression left over from this disc is one of poise and restraint, everything gorgeously under control, but at the same time with a sense of real music making – not overly sanitised, and certainly with plenty of character and depth. The recording is set in a pleasantly resonant acoustic, but still with plenty of detail. The playing is genuinely brilliant and sensitively lead in Yuri Bashmet’s interpretations. Bashmet of course has string technique as part of his DNA, but proves once again that there is plenty more to say through the medium of the small string orchestra.